Flowable composites were initially used in 1996. They are commonly used in dentistry applications. Flowable composites are developed to decrease polymerization shrinkage in adhesive applications where the cavity formation could not be established as required and create a barrier to break stress [1,2]. Since the flowable composites are compatible, consistent and easy to manipulate, their clinical use is quite high. New generation flowable composite resins, with their increased filler ratios, could also be used as permanent restoration material due to their increasing physical and mechanical specifications. Meanwhile, producers specified that newly developed nano-particle composites could be utilized in thick layers, similarly with the traditional composites . Consequently, flowable composite resins can be applied as permanent restorative material in clinical applications . Composite resins should have a high degree of polymerization. Increasing polymerization degree would result in a decrease in the residual monomer amount in the composite resin, which would in turn increase physical and mechanical specifications of the composite material . Polymerization shrinkage depends on many factors such as filler load, type of filler particles, monomer system, prepolymerized particles, etc. . The filler content and resin matrix composition detect the amount of volumetric shrinkage of the resin composites . Furthermore, Kleverlaan et al. showed a higher filler load decreases the amount of resin in the resin composite and, therefore, a decrease in shrinkage . In this study, the CHF group with a filler ratio of 62 % has higher polymerization shrinkage than the others. Therefore, these findings are evidence of the relationship between filler ratio and shrinkage. The final shrinkage-strain values, ranging from 1.26 to 2.73% at 23°C, are in broad agreement with previous results [8,9]. Flowable composites exhibit generally higher shrinkage-strains than conventional composites, as expected from their lower filler loading . CMF flowable demonstrated the lowest shrinkage-strain and CHF showed the highest shrinkage value. This conforms to the idea that high filler loading reduces shrinkage-strain and can explain the range of values between the flowable resin-composites, together with the strong correlation between the shrinkage-strain and the filler content . Polymerization shrinkage of composite resins is realized in two phases. These are the pre-gel phase, where the composite resin is transformed from the viscose state to the gel state, and the post-gel phase, also called hard phase, where the gel form is hardened . The volumetric change in the shrinkage of the composite resin during the transformation from the viscose state to the gel state is higher than the change that occurs in the second phase. During the first phase of the polymerization shrinkage, since the resin is flowable, it could permeate into the cavity and the cavity walls, and the stress is lowered. Shrinkage could be balanced with the flowable nature of the composite resin. In the second phase of the polymerization, the movement is halted and the stress could not be met [12-17]. Shrinkage during polymerization causes tension in areas where the composite bonds with dental tissue, which results in micro-level gaps between the filling and dental tissue. Bacteria, fluids and ions could accumulate in these gaps. These micro-gaps enlarge due to temperature changes and stress, resulting in coloring, secondary caries, restoration fractures, post-operative sensitivity and followed by pulpal pathologies in the future [12,18,19]. Polymerization shrinkage and its rate are in close relationship with the long-term clinical success. The present study represents an effort in this direction by evaluation of the polymerization shrinkage of new flowable composites and comparison of these composites. The materials investigated and the tests carried out for each of them are listed in Table 1. Table 1: Materials used in this study. Teflon molds to prepare the samples, and LED (Elipar Freelight, 3M ESPE) light source to polymerize the materials were used. Two different molds were prepared. 2 × 6 mm standard molds were used for Clearfil Majesty Flow, Vertise Flow, Grandio Flow and Filtek Supreme Ultra Flow. Also, 4 × 6 mm standard molds (Figure 1) were used for bulk fill composites that could be used as dentin replacement and that could be applied to the cavity up to 4 mm thickness (Surefill SDR Flow, Filtek Bulk Fill and X-Tra Base Flowable). In the control group, one type of standard flowable composite resin (Filtek Supreme Ultra Flowable) was utilized. A total of 10 samples in each group were prepared. 80 samples were prepared for 8 groups in total. Figure 1: Teflon molds and components used in this study. Firstly, the μCT was calibrated using a phantom standard at 70 Kvp/BH 200 mgHA/ccm. After composite resins were placed in standard molds, samples were scanned for 1 h in μ-CT - Skyscan 1172. The μ-CT projection images were acquired at 100 kVp, 450 mA, 9 m pixel size, 1 milliamperes, 360 degrees reconstruction angle, 2 degrees rotation angle and a resolution of 90 μm before LED-light polymerization. The average of the total number of slices was 512, with an average scan time of 1 h. The μ-CT images were reconstructed to give a volume data set. The kVp and exposure time were kept consistent for all samples. The 2D projections acquired were elaborated to generate the volume of interest. Acquired μCT data were evaluated with μ-CT CTAn software programme after image Reconstruction. Shrinkage was not observed during scanning since the inner compartment (Figure 2) of the equipment was totally dark. After the material was scanned, it was polymerized according to the producers’ recommendations and then rescanned with Skyscan 1172 equipment using the previous parameters. Finally, polymerization shrinkage of the created three dimensional objects was analyzed. Figure 2: Micro CT SkyScan !172 device, shrinkage was not observed during scanning since the inner compartment. After the sample was placed in the device, the object was rotated 360 degrees. A shadow image and transition image were created at each angle position. A shadow image and transition image were created at each angle position. The images were recorded as discrete 16 bit TIFF files. After the scan was finished, a series of x-ray images were created. The number of images produced varies depending on the device's selected rotation speed and the total number of rotations. Reconstruction was started after all these operations. 16 bit TIFF images were used to reconstruct the virtual slices throughout the object. Raw data sections were created after reconstruction. Analysis was performed using raw data. The following operations were performed in order to determine volume of the sample before and after polymerization; μ-CT CTAn software program was used to select the region to be analyzed first (Figure 3). 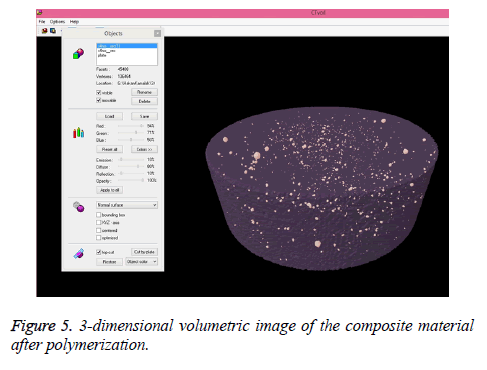 After the relevant region was selected, the material was examined with the 3D imaging tab to determine the correctness of the area (Figure 4). After the materials are detected in 3D, the volume of the materials before and after polymerization was calculated. The post-polymerization 3D image of the materials is shown in Figures 5 and 6. Figure 3: Selection of the relevant area of the flowable composite material to be analyzed (composite material indicated by black arrow, Teflon mold indicated by orange arrow). 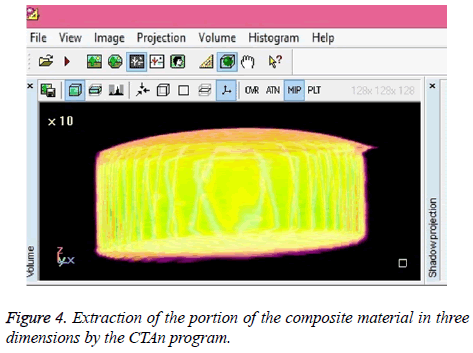 Figure 4: Extraction of the portion of the composite material in three dimensions by the CTAn program. Figure 5: 3-dimensional volumetric image of the composite material after polymerization. 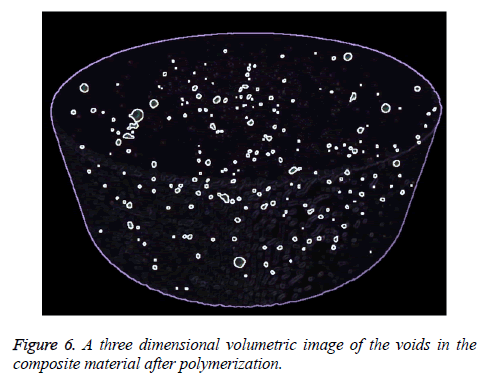 Figure 6: A three dimensional volumetric image of the voids in the composite material after polymerization. IBM SPSS Statistics 22 (IBM SPSS, Turkey) software was used to analyze the findings of the study. Since the parameters did not exhibit normal distribution, Kruskal Wallis test was used for inter-group comparison of the parameters, while Mann Whitney U-test was utilized in determination of the group causing the disparity. Wilcoxon signed rank test was used for intra-group comparisons of the parameters. The significance level was set at p<0.05. The average volumes of 3MEFU, CHF, GF, CMF, VF, XTB, 3MBF, SDR materials before polymerization was found to be statistically different from the average volumes after polymerization (Figure 7 and Table 2) (p<0.05). Table 2: Evaluation of the average of the materials’ volume for each group. Figure 7: The volumes of flowable composite resins before and after polymerization (mm3). Statistically differences were observed between the polymerization shrinkage percentage changes based on the material groups (p: 0.003; p<0.01). Post-hoc tests, conducted to determine which material group caused the differences, determined that the change in CHF group was slightly higher than CMF (p: 0.009; p<0.01), XTB (p: 0.009; p<0.01), 3MBF (p: 0.047; p<0.05), and SDR (p: 0.009; p<0.01) groups (Figure 8). Figure 8: Percentage changes of materials volume before and after polymerization. The amount of change in GF group was slightly higher than CMF (p: 0.009; p<0.01), XTB (p: 0.009; p<0.01), and SDR (p: 0.047; p<0.05) groups. The amount of change in 3MEFU group was higher than CMF (p: 0.028; p<0.05) and XTB (p: 0.016; p<0.05) groups. There was no significant difference between other material groups based on polymerization shrinkage percentage changes (p>0.05). Table 3 compares pre-polymerization and post-polymerization percentage changes in the volumes of the materials statistically. Table 3: Compares of percentage changes in the materials’ volumes from pre-polymerization and post-polymerization statistically. Flowable composite resins are widely used today as restorative materials due to their physical characteristics, changes in their formulations, their ease of application, their perfect adaptation in covering the defects in cavities and cavity walls. New generation flowable composite resins with increased filler rates and increased physical and mechanical characteristics are also used as permanent restorative material . However, for the new generation flowable composite resins to be widely used, their physical and mechanical characteristics should be further determined. Thus, this study aimed to research the polymerization shrinkage of the newly developed flowable composites with increased filler content. Different methods such as Coordinate Measurement Equipment, Optical Coherence Tomography and Archimedes Principles were used to determine polymerization shrinkage of restorative materials. 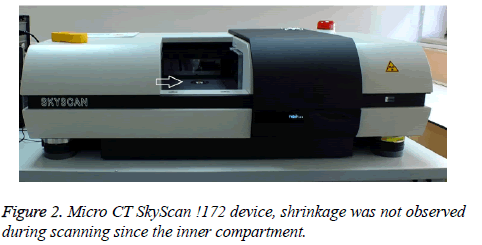 SkyScan 1172 desktop X-ray μ-CT equipment was used in this study to analyze the polymerization shrinkage of the materials . This system enables the analysis of materials in three dimensions in coronal, sagittal and axial directions and in minute detail. Rather accurate equipment, μ-CT enables full and correct analysis of pre-process and post-process materials with sufficient opacity. Studies demonstrated that μ-CT use provides reliable results for polymerization shrinkage measurements . As the mass of the composite resins that is placed in the cavity increases, polymerization shrinkage increases as well . Thus, polymerization shrinkage of the bulk fill resins that could be used as dentin replacement and could be applied in the cavity at a thickness of 4 mm was also evaluated in addition to normal flowable composite resins in this study. Skyscan 1172, new generation micro computed tomography equipment, is widely used to analyze physical specifications of materials lately. While clinical CT equipment could typically produce images that are formed by 1 mm3 volume voxels, X-ray Computed Tomography (Micro-CT or μCT) systems, developed during the early 1980’s, produce higher resolution images with 1,000,000 times smaller voxels volumetrically . After the samples are immobilized within the equipment, they are scanned by a stationary x-ray source while they are rotated on the vertical axis . Pre-process and post-process volumes of the material could be determined aright by using a micro-CT device. Latest versions of these systems allow even the examination of small living animals . The software program CT-Analyzer (CTAn) is utilized to create visuals and to derive quantitative parameters from data sets produced by Skyscan μ-CT equipment. CTAn provides real time processed 3D volume model imaging. A new data array could be written via CTAn . Filler content of materials could affect the polymerization shrinkage. In composite resins with higher filler content, polymerization shrinkage decreased due to the volumetric shrinkage amount. In a study, Ayman et al. analyzed the effects of resin matrix content on polymerization shrinkage. They have determined that as the organic matrix (TEGDMA) content increased, polymerization shrinkage increased as well due to a decrease in material viscosity . Although the material such as TEGDMA with low molecule weight and containing high levels of diluting monomers demonstrate high volumetric shrinkage, they also display high shrinkage stress due to increasing conversion rates [29-32]. Stress formation in the material is based on the polymerization reaction kinetics . Findings of the study showed that CHF group had higher shrinkage conversion amount than other groups in the study; hence CHF group demonstrated more shrinkage than other groups. CHF group had smaller percentage of filler content than other groups. It could be argued that this material had more shrinkage rate than other groups due to its lower filler ratio. Although the filler content of CMF and SDR are higher than other groups, the polymerization shrinkage of XTB, which has lower filler content than CMF and SDR, was found to be lower than these. It was considered that the matrix type of the materials was the cause of this difference. Polymerization shrinkage percentage conversions of the materials used in the study are displayed in Figure 2. Pre-polymerization and post-polymerization volume averages of the material are demonstrated in Table 2 and in Figure 1. In their study, Garcia et al. investigated polymerization shrinkage and polymerization depth of bulk fill flowable composites. Two bulk fill and one standard flowable composites were used in that study. Researchers found the polymerization shrinkage for Filtek Ultimate as 3.43 ± 0.51%, and for SDR as 3.57 ± 0.63%. They have indicated that bulk fill composite resin displayed more polymerization shrinkage when compared to the control group (145). Polymerization shrinkage values for Filtek ultimate and SDR were found as 2.14 ± 0.8% and 1.54 ± 0.39% in this study respectively. Polymerization shrinkage amount was found higher in the control group (3MEFU) in this study. This difference in polymerization shrinkage could be due to the differences in the organic matrix of the material. Jeong et al. researched the polymerization shrinkage and micro hardness of flowable composite resins that were polymerized using blue light laser. They have used 7 different flowable composites in their study. Findings demonstrated that polymerization shrinkage for X-tra flow was higher than Grandia Flow . However, in this study, Grandio Flow displayed a higher shrinkage than X-tra flow. In a study by Bukovinszky et al., polymerization shrinkage, elastic module related to shrinkage, degree of conversion and shrinkage stress were evaluated. Three different flowable composite resins and a composite resin without filler (Charism Flow, SDR, Filtek Ultimate) were used in that study. Degree of conversion was measured by FT-IR spectroscopy, while the volumetric shrinkage was calculated using the Archimedes principles. At the end of the study Charisma flow composite resin displayed high shrinkage, low elastic module and high degree of conversion . In this study, volumetric shrinkage was assessed using Micro-CT Skyscan 1172 and CTAn software. Shrinkage amount for Charisma Flow was observed to be significantly higher than other groups. Charisma Flow contains less filler content percentage when compared to other material. Thus, it could be considered that the high level of shrinkage in Charisma Flow could be due to the low filler content. Yamomato et al. scrutinized polymerization shrinkage, polymerization stress and elastic module for different composite resins in their study. They found that Clearfil Majesty Flow demonstrated high shrinkage stress, high elastic module and had polymerization shrinkage of 1.5 ± 0.1% . In this study polymerization shrinkage of Clearfil Majesty Flow was found as 1.44 ± 0.2%. This study showed that Clearfil Majesty Flow had lesser shrinkage when compared to other groups. El-Damanhoury et al. evaluated polymerization shrinkage stress for bulk fill composite resins in their study. They established that SDR had lower polymerization shrinkage than other groups (1.71%) . In this study polymerization shrinkage of SDR (1.54%) was found to be lower than other groups (3MEFU, CHF, GF, VF and 3MBF). In a study by Pick et al., elastic modules, volumetric shrinkages and polymerization stress of composites were researched. It was stated that Grandio Flow demonstrated higher volumetric shrinkage (3.9 ± 0.3%) and lower elasticity module when compared to other material. However, polymerization shrinkage for Grandio Flow was established as higher than other groups . In the study, volumetric shrinkage of Grandio Flow was found to be higher than other groups as well. Deb et al. researched polymerization shrinkage of dental composite material in their study. It was found that Filtek Supreme composite displayed more shrinkage (2% in average) than other material . Similarly, in this study the shrinkage (2.04 ± 0.47%) of the material was observed as higher than other groups (SDR, XTB and CMF). Cadenaro et al. evaluated shrinkage stress of different composite material in their study. They have determined that Grandio Flow had a shrinkage stress of 3.3 ± 1.7 at the 20th second after polymerization and Filtek Supreme had a shrinkage stress of 4.9 ± 1.6. However, after the 40th second, Grandio Flow demonstrated higher shrinkage stress than other materials . Similarly in this study, Grandio Flow displayed higher shrinkage when compared to Filtek Supreme after 40 s of polymerization. Lee et al. determined the polymerization shrinkage using Positron Sensitive Photo Detector (PSPD) equipment in their study. 7 different flowable composite resins were used in that study. They have determined that Filtek Flow demonstrated shrinkage at the value of 2.24% (0.67) . In this study, where μ-CT equipment was used, the shrinkage amount for Filtek Flow was calculated as 2.14%. Differences in the equipment used, the molds used during the preparation of the samples and the homogenous placement of the material into the molds could be effective in obtaining different results in different studies. Garoushi et al. examined polymerization shrinkage for fiberen-forced composites in their study. They determined that the percentage polymerization shrinkage of Filtek Bulk Fill composite was higher than SDR . Similarly, in this study Filtek Bulk Fill composite demonstrated higher shrinkage when compared to SDR. It could be stated that polymerization shrinkage decreased due to the higher filler content in SDR and the existence of a different monomer, EBPADMA, in SDR organic matrix. In their study, Leprince et al. scrutinized the mechanical specifications of bulk fill composite resins. They have calculated the degree of conversion of the material using Raman Spectrophotometer, the elastic module using threepoint test, the surface hardness using Vickers Micro Hardness test, and filler content using Thermo-Gravimetric Analysis. They have found the percentage filler content for X-tra Base as 74.4%, for SDR as 69% and for Filtek Bulk Fill composite as 60.7%. They determined that the degree of conversion was the highest for SDR and the lowest for Filtek Bulk Fill. However, they also determined that elastic module was the highest for X-tra Base . In this study, shrinkage amount for X-tra Base composite was determined as lower than other composites (SDR, 3MBF, VF, CMF, GF, CHF ve 3MEFU). Milena et al. assessed the shrinkage stress of 3 different flowable composites. Grandio Flow, Filtek Supreme, Tetric Flow, and one Universal micro hybrid composite (Filtek Z250, 3M ESPE, St. Paul, MN, USA) as the control group were utilized. Shrinkage stress was measured using stress analysis measurement equipment. The highest polymerization shrinkage was observed for Filtrek Supreme . In this study, more shrinkage was found for Grandio Flow when compared to Filtek Supreme composite. The findings of this study do not support the findings of Milena et al. The difference could be due to the differences in the measurement techniques. Polymerization shrinkage of the material could be affected by the type of the material, matrix content, filler ratio and filler content. Further knowledge has been obtained on flowable composites that have been increasingly used as permanent restorative material in dental clinical applications as a result of this study. We would like to express gratitude to our supervisor Muhammet Yalçın for the useful comments, remarks and engagement through the learning process of this research. Meanwhile, this research was supported by the Scientific and Technological Research Council of Turkey (TÜBİTAK /Project ID: 114S231). Jackson RD, Morgan M. The new posterior resins and a simplified placement technique. J Am Dent Assoc 2000; 131: 375-383. Summit JB RJ, Hilton TJ, Schwartz RS. Fundamentals of operative dentistry a contemporary approach. Quintessence Publishing USA 2006. Ikeda I, Otsuki M, Sadr A. Effect of filler content of flowable composites on resin-cavity interface. Dent Mater J 2009; 28: 679-685. Sakaguchi RLPJ. Craig's restorative dental materials. Elsevier 2012. RG C. Chemistry, composition, and properties of composite resins. Dent Clin North Am 1981; 25: 219-239. Kleverlaan CJ, Feilzer AJ. Polymerization shrinkage and contraction stress of dental resin composites. Dent Mater 2005; 21: 1150-1157. Labella R, Lambrechts P, Van Meerbeek B, Vanherle G. Polymerization shrinkage and elasticity of flowable composites and filled adhesives. Dent Mater 1999; 15: 128-137. Stavridakis MM, Dietschi D, Krejci I. Polymerization shrinkage of flowable resin-based restorative materials. Operative Dent 2005; 30: 118-128. Bayne SC, Thompson JY, Swift EJ, Stamatiades P, Wilkerson M. A characterization of first-generation flowable composites. Journal of the Am Dent Assoc 1998;129:567-77. Baroudi K, Saleh AM, Silikas N, Watts DC. 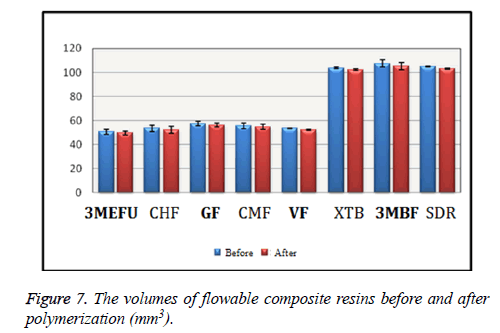 Shrinkage behaviour of flowable resin-composites related to conversion and filler-fraction. J Dent 2007; 35: 651-655. Dayangaç BÖG. Kompozit rezinlerde polimerizasyon büzülmesi. Ege Dishekimligi Fakültesi Dergisi 1992; 13: 45-48. Bausch JR, de Lange K, Davidson CL, Peters A, de Gee AJ. Clinical significance of polymerization shrinkage of composite resins. J Prosthet Dent 1982; 48: 59-67. Davidson CL, de Gee AJ, Feilzer A. The competition between the composite-dentin bond strength and the polymerization contraction stress. J Dent Res 1984; 63: 1396-1399. Davidson CL, de Gee AJ. Relaxation of polymerization contraction stresses by flow in dental composites. J Dent Res 1984; 63: 146-148. Feilzer AJ, De Gee AJ, Davidson CL. Setting stress in composite resin in relation to configuration of the restoration. J Dent Res 1987; 66: 1636-1639. Sakaguchi RL, Sasik CT, Bunczak MA, Douglas WH. Strain gauge method for measuring polymerization contraction of composite restoratives. J Dent 1991; 19: 312-316. Yap AU, Soh MS, Siow KS. Effectiveness of composite cure with pulse activation and soft-start polymerization. Oper Dent 2002; 27: 44-49. Eick JD, Welch FH. Polymerization shrinkage of posterior composite resins and its possible influence on postoperative sensitivity. Quintessence Int 1986; 17: 103-111. N G. Kompozit dolgu maddelerinde polimerizasyon büzülmesi. Ege Dishekimligi Fakültesi Dergisi 1992; 13: 8-13. Fischer TJ, Psaltis GL. The diastema and the abnormal frenum. J Dent Children 1981; 48: 264-268.
de Melo Monteiro GQ, Montes MA, Rolim TV. Alternative methods for determining shrinkage in restorative resin composites. Dent Mater 2011; 27: 176-185. Zeiger DN, Sun J, Schumacher GE, Lin-Gibson S. Evaluation of dental composite shrinkage and leakage in extracted teeth using X-ray microcomputed tomography. Dent Mater 2009; 25: 1213-1220. Rueggeberg FA, Ergle JW, Mettenburg DJ. Polymerization depths of contemporary light-curing units using micro hardness. J Esthet Dent 2000; 12: 340-349. Kuhn JL, Goldstein SA, Feldkamp LA, Goulet RW, Jesion G. Evaluation of a microcomputed tomography system to study trabecular bone structure. J Orthop Res 1990; 8: 833-842. Ritman EL. Current status of developments and applications of micro-CT. Annu Rev Biomed Eng 2011; 13: 531-552. Guldberg RE, Lin AS, Coleman R, Robertson G, Duvall C. Microcomputed tomography imaging of skeletal development and growth. Birth Defects Res C Embryo Today 2004; 72: 250-259. Kullanım klavuzu. SksScan 1172 X-ray mikrotomografi. Vlunchtenburgstraat 3C 2630-Aartselaar 2005; 9-11. Ellakwa A, Cho N, Lee IB. The effect of resin matrix composition on the polymerization shrinkage and rheological properties of experimental dental composites. Dent Mater 2007; 23: 1229-1235. Braga RR, Ballester RY, Ferracane JL. Factors involved in the development of polymerization shrinkage stress in resin-composites: a systematic review. Dent Mater 2005; 21: 962-970. Alvarez-Gayosso C, Barcelo-Santana F, Guerrero-Ibarra J, Saez-Espinola G, Canseco-Martinez MA. Calculation of contraction rates due to shrinkage in light-cured composites. Dent Mater 2004; 20: 228-235. Atai M, Watts DC, Atai Z. Shrinkage strain-rates of dental resin-monomer and composite systems. Biomaterials 2005; 26: 5015-5020. Feilzer AJ, Dauvillier BS. Effect of TEGDMA/BisGMA ratio on stress development and viscoelastic properties of experimental two-paste composites. J Dent Res 2003; 82: 824-828. Jeong CM, Heo YJ, Jeon YC, Kim HI, Kwon YH. Microhardness and polymerization shrinkage of flowable resins that are light cured using a blue laser. Lasers Med Sci 2012; 27: 729-733. Bukovinszky K, Molnar L, Bako J, Szaloki M, Hegedus C. Comparative study of polymerization shrinkage and related properties of flowable composites and an unfilled resin. Fogorv Sz 2014; 107: 3-8. Yamamoto T, Kubota Y, Momoi Y, Ferracane JL. Polymerization stresses in low-shrinkage dental resin composites measured by crack analysis. Dent Mater 2012; 28: 143-149. El-Damanhoury H, Platt J. Polymerization shrinkage stress kinetics and related properties of bulk-fill resin composites. Oper Dent 2014; 39: 374-382. Pick B, Pelka M, Belli R, Braga RR, Lohbauer U. Tailoring of physical properties in highly filled experimental nanohybrid resin composites. Dent Mater 2011; 27: 664-669. Deb S, Di Silvio L, Mackler HE, Millar BJ. Pre-warming of dental composites. Dent Mater 2011; 27: 51-59. Cadenaro M, Marchesi G, Antoniolli F. Flowability of composites is no guarantee for contraction stress reduction. Dent Mater 2009; 25: 649-654. Lee IB, Cho BH, Son HH, Um CM. A new method to measure the polymerization shrinkage kinetics of light cured composites. J Oral Rehabil 2005; 32: 304-314. Garoushi S, Sailynoja E, Vallittu PK, Lassila L. Physical properties and depth of cure of a new short fiber reinforced composite. Dent Mater 2013; 29: 835-841. Leprince JG, Palin WM, Vanacker J. Physico-mechanical characteristics of commercially available bulk-fill composites. J Dent 2014; 42:993-1000.